Cocaine is a naturally occurring compound indigenous to the Andes Mountains, West Indies, and Java. It was the first anesthetic to be discovered and is the only naturally occurring local anesthetic; all others are synthetically derived. Cocaine was introduced into Europe in the 1800s following its isolation from coca beans. Sigmund Freud, the noted Austrian psychoanalyst, used cocaine on his patients and became addicted through self-experimentation. In the latter half of the 1800s, interest in the drug became widespread, and many of cocaine's pharmacologic actions and adverse effects were elucidated during this time. In the 1880s, Koller introduced cocaine to the field of ophthalmology, and Hall introduced it to dentistry. Halsted was the first to report the use of cocaine for nerve blocks, in the United States in 1885, and also became addicted to the drug through self-experimentation. Procaine, the first synthetic derivative of cocaine, was developed in 1904. Lofgren later developed lidocaine, the most widely used cocaine derivative, in 1943, during World War II. Local anesthetics produce anesthesia by inhibiting excitation of nerve endings or by blocking conduction in peripheral nerves. This is achieved by anesthetics reversibly binding to and inactivating sodium channels. Sodium influx through these channels is necessary for the depolarization of nerve cell membranes and subsequent propagation of impulses along the course of the nerve. When a nerve loses depolarization and capacity to propagate an impulse, the individual loses sensation in the area supplied by the nerve. All local anesthetics have an intermediate chain linking an amine on one end to an aromatic ring on the other. The amine end is hydrophilic, and the aromatic end is lipophilic. Variation of the amine or aromatic ends changes the chemical activity of the drug. 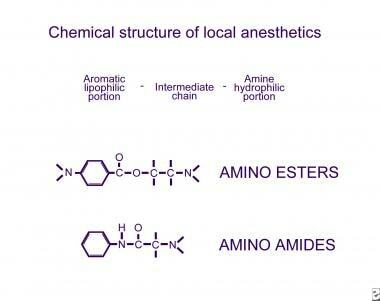 Two basic classes of local anesthetics exist, the amino amides and the amino esters. Amino amides have an amide link between the intermediate chain and the aromatic end, whereas amino esters have an ester link between the intermediate chain and the aromatic end. Amino esters and amino amides differ in several respects. Amino esters are metabolized in the plasma via pseudocholinesterases, whereas amino amides are metabolized in the liver. Amino esters are unstable in solution, but amino amides are very stable in solution. Amino esters are much more likely than amino amides to cause allergic hypersensitivity reactions. Commonly used amino amides include lidocaine, mepivacaine, prilocaine, bupivacaine, etidocaine, and ropivacaine and levobupivacaine. [2, 3] Commonly used amino esters include cocaine, procaine, tetracaine, chloroprocaine, and benzocaine. An easy way to rememberwhich drug belongs in which category is that all of the amino amides contain the letter "i" twice, as does the term "amino amides." Newer additions to clinically available local anesthetics, namely ropivacaine and levobupivacaine, represent exploitation of the S enantiomer of these chemicals to create anesthetics which are less toxic, more potent, and longer acting. Physiologic activity of local anesthetics is a function of their lipid solubility, diffusibility, affinity for protein binding, percent ionization at physiologic pH, and vasodilating properties. Lipid solubility is an important characteristic. Potency is directly related to lipid solubility, because 90% of the nerve cell membrane is composed of lipid. Increased lipid solubility leads to faster nerve penetration and blockade of sodium channels. Diffusibility of the local anesthetic through tissue other than nerve tissue also influences the speed of action onset. Protein binding is related to the duration of action. The more firmly the local anesthetic binds to the protein of the sodium channel, the longer the duration of action. Local anesthetics exist in ionized and non-ionized forms, the proportions of which vary with the pH of the environment. The non-ionized portion is the form that is capable of diffusing across nerve membranes and blocking sodium channels. Anesthetics with presence of greater non-ionized portions have a faster onset of action. Local anesthetics differ in respect to the pH at which the ionized and non-ionized forms are present at equilibrium, but this pH is generally in the range of 7.6-8.9. The more closely the equilibrium pH for a given anesthetic approximates the physiologic pH of tissues (ie, 7.35-7.45), the more rapid the onset of action. A decrease in pH shifts equilibrium toward the ionized form, delaying onset of action. This explains why local anesthetics are slower in onset of action and less effective in the presence of inflammation, which creates a more acidic environment with lower pH. Contrastingly, the addition of sodium bicarbonate is used clinically to increase the pH of local anesthetic solutions thereby enhancing onset of action. Overzealous alkalinization, however, can cause local anesthetic molecules to precipitate from solution. All local anesthetics, with the exception of cocaine, are vasodilators. Vasodilation occurs via direct relaxation of peripheral arteriolar smooth muscle fibers. Greater vasodilator activity of a local anesthetic leads to faster absorption and, thus, shorter duration of action. To counteract this vasodilatation, epinephrine is often included in local anesthetic solutions, as is discussed in the section Administration of Local Anesthetics. For proper administration of local anesthetics, consider the individual characteristics of the patient, dose of local anesthetic to be administered, presence or absence of epinephrine, speed of administration, local tissue vascularity, and technique of administration. In each case, physicians should strive to find the smallest dose possible administered over the longest period of time that achieves adequate anesthesia. Dosages are presented in the table below. Dilution of the concentration of local anesthetic may aid in decreasing the total dose required to establish adequate anesthesia. Commercial preparations of local anesthetics are typically provided in bottles of 1% or 2% concentrations. These concentrations are higher than those required to produce the desired effect in most individuals. By diluting the solution with sterile injectable saline, the surgeon can decrease concentration to 0.25%, 0.5%, or other concentrations. This provides additional volume for injection over a larger operative field without increasing the total dose administered. A word of caution is necessary. Commonly, when drawing up local anesthetic solution for injection, the solution is prepared by the circulating nurse or scrub nurse. Calculating doses from percentages can be confusing, and preparation of local anesthetic solutions may involve mixing multiple medications, including local anesthetic, epinephrine, bicarbonate, and sterile saline. The author knows of one situation in which the surgeon inadvertently injected formalin into the upper eyelids of a patient undergoing blepharoplasty. The surgeon must ensure that all injectable solutions contain the proper medications, dose, and concentration. Since local anesthetics are vasodilators, they tend to be absorbed into the bloodstream from the operative field because of vasodilatation of peripheral arterioles. Epinephrine induces vasoconstriction, delaying absorption of the local anesthetic for longer duration of action at the site of injection. By delaying absorption, epinephrine also increases the safe dose of local anesthetic that may be administered. Addition of epinephrine also improves hemostasis of the operative field, which may decrease duration of the operation and thus obviate the need for prolonged local anesthetic effect. This can help avoid the need for subsequent injection if local anesthetic begins to wear off as surgery proceeds. Epinephrine has been demonstrated to cause effective vasoconstriction at concentrations as small as 1:1,000,000, although most surgeons use a concentration of 1:100,000 to 1:400,000, which is available in commercial preparations. Lower concentrations of epinephrine require longer to achieve maximal effect. Thus, when using dilute concentrations of epinephrine, the surgeon should wait longer between injection and incision than when using solutions containing higher concentrations of epinephrine. Epinephrine has its own toxicities and should be used with caution in certain patients. Cardiac arrhythmias may be produced in patients with heart disease or with the concomitant use of halothane anesthesia. Hypertension may develop in patients with a preexisting history of hypertension or with hyperthyroidism. In some cases, hypertension may be severe and actually trigger a hypertensive crisis. Epinephrine has also been demonstrated to be detrimental to the survival of delayed or expanded flaps, since the new vessels present in these flaps appear to be exquisitely sensitive to the effects of epinephrine. Some authors prefer not to use local anesthetic solutions containing epinephrine on the helix of the ear or nasal alae, although this author has never encountered problems with its use in these locations. Bicarbonate is another drug that is commonly added to local anesthetic solutions, particularly when the patient is awake. Because the pH of local anesthetic solutions is generally 4-5 to prolong shelf life, patients often experience burning on injection. Addition of 1 cc of a 1 mEq/mL solution of bicarbonate for every 9 cc of local anesthetic can alleviate this burning and improve patient comfort. Speed of administration is also important because toxicity develops as a result of peak serum concentration. When multiple areas are to be anesthetized with local anesthetic, inject each site sequentially rather than all at once at the beginning of the procedure. If an area will not be operated on at the beginning of the procedure, wait to inject it until ready to extend the procedure to that site. This spreads the total dose of local anesthetic over a longer period, leading to lower peak serum levels. Tissue vascularity is another important consideration. Nasal mucosa, oral mucosa, the scalp, and the skin of the head and neck have a tremendous blood supply. This leads to rapid absorption of local anesthetics into the serum, which may precipitate an adverse reaction. When working in these areas, inject the area more slowly and wait longer between injections. Technique of injection is important for safety reasons and for patient comfort. Always aspirate before injecting. This prevents inadvertent direct intravascular injection of the local anesthetic, which leads to an abrupt rise in serum levels and may precipitate an adverse reaction. Using the smallest needle possible decreases the pain of injection. The author prefers a 22- or 25-gauge needle for the scalp and a 25- or 27-gauge needle for the face and neck. Warming the local anesthetic solution and injecting slowly decrease patient discomfort, since much of the discomfort is produced by rapid distention of tissues by the volume of the local anesthetic solution. Toxicity is related to the peak circulating levels of local anesthetics. Circulating levels are determined by the rates of absorption, distribution, and metabolism, all of which vary considerably from agent to agent. As previously described, the rate of absorption depends on the chemical structure, dose, presence or absence of epinephrine, speed of administration, local tissue vascularity, and technique of administration. Distribution of local anesthetic following absorption into the bloodstream occurs in 3 phases. Initially, uptake occurs by highly vascular tissues such as the lungs and kidneys. Subsequently, the local anesthetic appears in less vascularized tissues such as muscle and fat. Finally, the drug is metabolized. Metabolism of local anesthetics depends on the chemical structure. Amino esterases are degraded primarily by plasma pseudocholinesterases. Amino amides are cleared primarily by hepatic metabolism with renal excretion. Adverse reactions may occur following administration of local anesthetics and usually result from administration of too much drug. Adverse reactions may also occur following injection of very vascular sites or from accidental direct intravascular injection of the drug. Deaths following local anesthetic administration are always a result of overdosage. Tissue toxicity can be achieved by all local anesthetics if “high” concentrations are used. Adverse reactions occur primarily in the CNS (neurotoxicity) and cardiovascular system (myotoxicity) because these tissues are also composed of excitable membranes, the target of local anesthetic action. In the CNS, a progression of signs and symptoms may be observed in the patient. The patient may report lightheadedness, tinnitus, circumoral numbness, a metallic taste, or double vision. Upon examination, the patient may become drowsy or slur speech and may develop nystagmus. At higher levels of anesthetics, the patient may become anxious and develop fine tremors of the muscles of the hands and/or face. These tremors may worsen and coalesce into a grand mal seizure. Ultimately, the patient may experience generalized CNS depression leading to hypoxia, acidosis, and respiratory arrest. Local anesthetics decrease the rate of depolarization of cardiac tissue, which is the rationale behind the use of lidocaine in treatment of ventricular arrhythmias. At higher concentrations, amplitude of the cardiac action potential is decreased, and the velocity of conduction is reduced. At toxic doses, the negative inotropic effects of local anesthetics may lead to bradycardia, ventricular fibrillation, or asystole. Other cardiovascular effects include hypotension, which occurs via the direct vasodilating effects of local anesthetics on peripheral arteriolar smooth muscle. Recognizing signs and symptoms of an adverse reaction to local anesthetics and administering emergency care in relation to the severity of the reaction are essential. With severe life-threatening reactions, immediately curtail the procedure. Activate advanced cardiac life support (ACLS) protocols immediately, including intubation and defibrillation if indicated. Hypotension may require intravenous fluids and vasoconstrictor drugs for circulatory support. Control seizure activity with diazepam 5-10 mg IV. Succinylcholine may be required to stop ongoing tremors, but its use requires intubation and mechanical ventilation. Atropine and epinephrine may be indicated to treat bradycardia. Above all, seek help immediately. In a hospital setting, assistance is usually close by. In the office surgery setting, call 911 immediately. The surgeon must direct resuscitation until assistance arrives. This requires that any surgeon using local anesthetics in the office be familiar with ACLS protocols and have proper equipment on hand should an emergency situation arise. Although exceedingly rare, hypersensitivity reactions may occur with use of local anesthetics. This is usually a reaction to the anesthetic or the preservative used in the solution. Allergic reactions are uncommon in the amino ester group and extremely rare in the amino amide group. Most reactions to local anesthetics are actually caused by anxiety, panic attacks, vasovagal responses, or accidental intravascular injection. True allergic reactions occur in fewer than 1% of all reactions to local anesthetics. The cause of hypersensitivity reactions is believed to be a breakdown product created by the action of serum pseudocholinesterases on the amino ester paraaminobenzoic acid (PABA). PABA is very antigenic and is capable of sensitizing lymphocytes and eliciting formation of antibodies for a humoral immune response. Hypersensitivity reactions may be type I reactions manifested by a spectrum of symptoms from local or systemic urticaria to anaphylactic shock, or type IV reactions manifested by contact dermatitis or anaphylactoid reactions. The patient may develop hypotension, tachycardia, hives, angioedema, dyspnea, bronchospasm with wheezing, or rhinorrhea. Ceasing the operation immediately at the onset of any signs or symptoms of a severe allergic reaction is important. Antihistamines and corticosteroids are first-line treatments, to be administered concomitantly with activation of ACLS protocols and the Emergency Medical Services (EMS) system. If a patient has a reaction to a local anesthetic, assuming that he or she is also sensitive to other agents in the same class is the safest route. Most patients with a hypersensitivity reaction to an amino ester can probably be treated safely with an amino amide. However, many commercial amino amide preparations contain methylparaben as a preservative. Methylparaben is chemically similar to PABA and is capable of eliciting a hypersensitivity reaction. The extremely rare cases of hypersensitivity reactions to amino amides probably are related to the methylparaben preservative rather than to the amino amide. Mepivacaine commercial preparations do not contain methylparaben and can usually be substituted safely in this situation. If any question exists regarding a prior hypersensitivity reaction to local anesthetics, initially administer a test dose prior to proceeding with the intended therapeutic amount. Alternatively, referral to an allergist can help elucidate a suspected allergy to a local anesthetic. Skin testing and incremental dose challenges can be performed as recommended by the Joint Council of Allergy, Asthma, and Immunology (JCAAI). The JCAAI has shown this strategy to be safe and efficacious. In addition to its local anesthetic and anti-arrhythmic effects, lidocaine also has been studied as a tinnitus-suppressing drug. Following the accidental discovery of the tinnitus-suppressing effect of procaine described by Barany in 1935, extensive research was conducted on the intravenous administration of lidocaine as a treatment for tinnitus. In 1992, Murai et al, reported that 40-80% of tinnitus patients had a reduction in their tinnitus with the intravenous administration of lidocaine. Unfortunately, problems with systemic toxicity limit the practicality of lidocaine as an effective treatment for tinnitus. Other authors have studied transtympanic injection and intradermal injection of lidocaine as an alternative route of administration without much success. Even oral administration of lidocaine has been attempted but found to be ineffective due to its poor biologic availability following ingestion. Analogs of lidocaine that can be administered orally have been unsuccessful as well. Research suggests that lidocaine suppresses some forms of tinnitus in either the cochlea or the central auditory system, or potentially in both locations, depending on the kind of tinnitus and the mode of application. The inferior colliculus may be one central target of lidocaine. Evidence indicates that various molecular channels and receptors in this area that are linked to tinnitus are affected by lidocaine. As the specific mechanism of tinnitus inhibition by lidocaine is elucidated, new pharmacological targets for the treatment of tinnitus may be devised. Marhofer P, Willschke H, Kettner SC. Ultrasound-guided upper extremity blocks - tips and tricks to improve the clinical practice. Paediatr Anaesth. 2011 Nov 14. [Medline]. Lam DS, Law RW, Ng AS, Lam PT, Jhanji V, Lee VY, et al. Randomized Double-Masked Controlled Trial Comparing Pain Scores With and Without the Use of Supplementary 2% Lidocaine Gel in LASIK. Am J Ophthalmol. 2011 Nov 19. [Medline]. Grider JS, Mullet TW, Saha SP, Harned ME, Sloan PA. A Randomized, Double-Blind Trial Comparing Continuous Thoracic Epidural Bupivacaine With and Without Opioid in Contrast to a Continuous Paravertebral Infusion of Bupivacaine for Post-thoracotomy Pain. J Cardiothorac Vasc Anesth. 2011 Nov 16. [Medline]. Saraghi M, Hersh EV. Three newly approved analgesics: an update. Anesth Prog. 2013 Winter. 60 (4):178-87. [Medline]. [Full Text]. Vyas KS, Rajendran S, Morrison SD, et al. Systematic Review of Liposomal Bupivacaine (Exparel) for Postoperative Analgesia. Plast Reconstr Surg. 2016 Oct. 138 (4):748e-56e. [Medline]. Durai R, Ng PC. Practical application of using local anaesthetics: surgical perspectives. Acta Chir Belg. 2013 Jan-Feb. 113(1):64-9. [Medline]. Becker DE, Reed KL. Local anesthetics: review of pharmacological considerations. Anesth Prog. 2012 Summer. 59(2):90-101; quiz 102-3. [Medline]. [Full Text]. Warren VT, Fisher AG, Rivera EM, et al. Buffered 1% Lidocaine With Epinephrine Is as Effective as Non-Buffered 2% Lidocaine With Epinephrine for Mandibular Nerve Block. J Oral Maxillofac Surg. 2017 Jan 5. [Medline]. Aggarwal N. Local anesthetics systemic toxicity association with exparel (bupivacaine liposome)- a pharmacovigilance evaluation. Expert Opin Drug Saf. 2017 Jun 5. 1-7. [Medline]. Mowry JB, Spyker DA, Cantilena LR Jr, et al. 2013 Annual Report of the American Association of Poison Control Centers' National Poison Data System (NPDS): 31st Annual Report. Clin Toxicol (Phila). 2014 Dec. 52(10):1032-283. [Medline]. [Full Text]. Murai K, Tyler RS, Harker LA, et al. Review of pharmacologic treatment of tinnitus. Am J Otol. 1992 Sep. 13(5):454-64. [Medline]. To D, Kossintseva I, de Gannes G. Lidocaine contact allergy is becoming more prevalent. Dermatol Surg. 2014 Dec. 40(12):1367-72. [Medline]. Altman RS, Smith-Coggins R, Ampel LL. Local anesthetics. Ann Emerg Med. 1985 Dec. 14(12):1209-17. [Medline]. Batai I, Kerenyi M, Tekeres M. The impact of drugs used in anaesthesia on bacteria. Eur J Anaesthesiol. 1999 Jul. 16(7):425-40. [Medline]. Boren E, Teuber SS, Naguwa SM, et al. A critical review of local anesthetic sensitivity. Clin Rev Allergy Immunol. 2007 Feb. 32(1):119-28. [Medline]. Butterworth JF 4th, Strichartz GR. Molecular mechanisms of local anesthesia: a review. Anesthesiology. 1990 Apr. 72(4):711-34. [Medline]. Cousins MJ, Mather LE. Clinical pharmacology of local anaesthetics. Anaesth Intensive Care. 1980 Aug. 8(3):257-77. [Medline]. de Jong RH. Toxic effects of local anesthetics. JAMA. 1978 Mar 20. 239(12):1166-8. [Medline]. DiFazio CA. Local anesthetics: action, metabolism, and toxicity. Otolaryngol Clin North Am. 1981 Aug. 14(3):515-9. [Medline]. Emslander HC. Local and topical anesthesia for pediatric wound repair: a review of selected aspects. Pediatr Emerg Care. 1998 Apr. 14(2):123-9. [Medline]. Fox AJ, Rowbotham DJ. Anaesthesia. BMJ. 1999 Aug 28. 319(7209):557-60. [Medline]. Glinert RJ, Zachary CB. Local anesthetic allergy. Its recognition and avoidance. J Dermatol Surg Oncol. 1991 Jun. 17(6):491-6. [Medline]. Lieberman NA, Harris RS, Katz RI, et al. The effects of lidocaine on the electrical and mechanical activity of the heart. Am J Cardiol. 1968 Sep. 22(3):375-80. [Medline]. Peng PW, Chan VW. Local and regional block in postoperative pain control. Surg Clin North Am. 1999 Apr. 79(2):345-70. [Medline]. Phillips JF, Yates AB, Deshazo RD. Approach to patients with suspected hypersensitivity to local anesthetics. Am J Med Sci. 2007 Sep. 334(3):190-6. [Medline]. Schenck NL. Local anesthesia in otolaryngology. A re-evaluation. Ann Otol Rhinol Laryngol. 1975 Jan-Feb. 84(1 Pt 1):65-72. [Medline]. Scott DB. Toxicity caused by local anaesthetic drugs. Br J Anaesth. 1981 Jun. 53(6):553-4. [Medline]. Singh V, Brockbank MJ, Todd GB. Flexible transnasal endoscopy: is local anaesthetic necessary?. J Laryngol Otol. 1997 Jul. 111(7):616-8. [Medline]. Smith DW, Peterson MR, DeBerard SC. Local anesthesia. Topical application, local infiltration, and field block. Postgrad Med. 1999 Aug. 106(2):57-60, 64-6. [Medline]. Trellakis S, Lautermann J, Lehnerdt G. Lidocaine: neurobiological targets and effects on the auditory system. Prog Brain Res. 2007. 166:303-22. [Medline]. [Full Text]. Yagiela JA. Intravascular lidocaine toxicity: influence of epinephrine and route of administration. Anesth Prog. 1985 Mar-Apr. 32(2):57-61. [Medline]. Yanagidate F, Strichartz GR. Local Anesthetics. Handbook of Experimental Pharmacology. Berlin, New York: Springer-Verlag; 2007. 177: 95-127. [Full Text].